Hey there. As most of you know, not all over the ear headphones are the same. Some look awesome but sound poorly. Others have great sound quality but their design is a head scratcher. A quick online search will yield plenty of great looking headphones that claim are the best sounding. But once you see that you need to cough up over $100 for them, you second guess that headset. But what if I were to tell you that you can get a great sounding set of headphones that look pretty good? Well… our friends at Sound Intone has you covered! 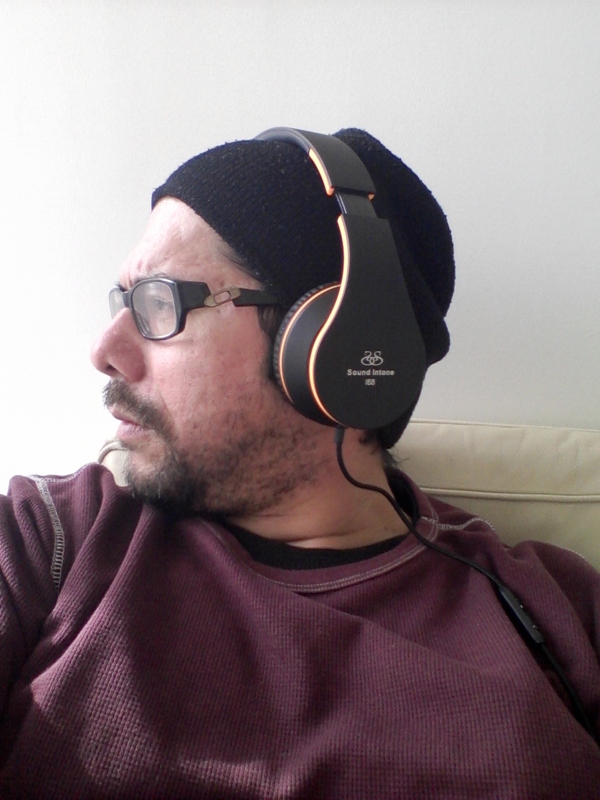 Sound Intone recently provided me the Sound Intone i68 Headphones (Black and Orange) to try out and review. I’ve been using the headphones for the last two weeks and I am now ready to give you guys my review. But before I go into my experience, let’s talk specs. At first glance, I wondered what the difference was between the Sound Intone i65 (check out my review here) and the Sound Intone i68 headset are. They both look extremely similar in design and thought that maybe I received the same set of headphones but just in a different color. Hmmm… Both are foldable, both are adjustable, both have a braided cord, both have similar color schemes, and both have an in line mic. First thing that came to mind was that maybe it’s the same product under a different name. Also of note is that the braided cord is non-detachable and you can only connect to devices using the 3.5mm jack input. 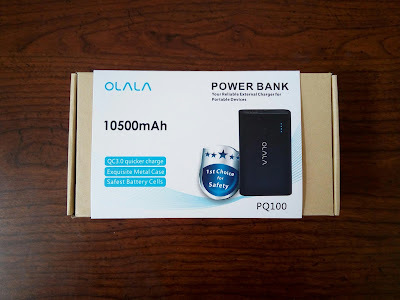 No Bluetooth connectivity or micro USB ports here. Upon opening the box, I love that the headphones are presented to you in the folded position. I think it’s neat that these headphones are foldable and look to be a strong point for them. Once I pulled out the Sound Intone i68 Headphones from the box, the differences between this and i65’s became a little more apparent. The feel is a bit different and the cord seemed a bit shorter. Other than that, I didn’t really notice anything special or surprising here. I really do like this design. Especially the feel of the Sound Intone i68 Headphones. The outside seems to be coated with this soft, rubber type lining that just feels great against the skin. It’s a far cry from the shiny, plastic design that other headsets boast. Also, the color scheme works really well. 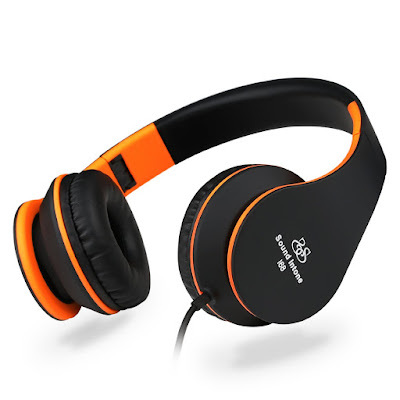 That is… if you get the black & orange or black & green headset. The other two are not so pleasant on the eyes. Just saying, Sound Intone. You guys could’ve picked better colors to match up with yellow. Anyways, with the right color combo, this pair of headphones look real sharp. Also, when you adjust the headphones fit comfortably, the small extension is the color of the accent. In my case, it was orange. I thought that was pretty cool. Added a little more color to the headset. Another awesome feature is that the headphones are foldable. This makes it super easy for carrying around during travel or for secure storage. Honestly, I think all headphones should be foldable now. How many times have your headphones snapped right above the ear cup because the headphones were just not flexible? With the i68 headphones, you won’t have to worry about that much since you can easily fold them up to protect them. Awesome, awesome feature. I absolutely love that. I also noticed that cord is about 5 feet long. Now, I’m more of a wireless guy because I just can’t deal with the cords. I’m a bit clumsy and I’ll get that cord tangled in everything and having a shorter cord is simply better for me. I found it a lot more manageable than the 6 foot cord I have found on other headsets and I was able even to take these bad boys to the gym and use while working out! Mind you, I tucked in the wire into my armband so that helped tremendously, but still! If I was able to manage with a 5 foot cord, I’m sure you guys can too. The control bar is nothing too fancy. A sliding bar (which I think is neat) to control the volume, a small single button, and a tiny hole make up the control bar. It seems to sit at just the right spot to adjust the volume or to speak into the mic. The soft leather (could be faux leather… couldn’t really tell) on the ear cups feel dreamy! They are that soft! And I love, ABSOLUTELY LOVE, that they will conform to your ear for maximum comfort! I’ve said this a million times… comfort cannot be sacrificed when it comes to over the ear headphones… Especially for someone with glasses!!! Because the leather cups will conform to your ear, glasses will not be pressed up against your head, making wearing the headset uncomfortable. This is a huge, HUGE plus for me. I have a long commute to work and if the headphones that I am wearing are not comfortable for long haul usage, I will NOT use them. Lastly, the headband… I was a little disappointed with the amount of padding, or lack there of, on the headband part of the headset. The part that rests against your head has very little in the way of your head being pressed up against the headband. It’s not uncomfortable or anything like that, BUT… I considering that it will be resting on your head, I would figure that you would want to add a little padding there. The sound quality of the Sound Intone i68 Headphone Headset is surprisingly good. The headset boasts high 40mm energy drivers to deliver some high quality sounds. As many of you know, I have a pretty long daily commute to and from my day job so I have almost 5 hours a day where I am wearing headphones to listen to music or watch a movie/show. Because I have so much time using the headset, I have a pretty good idea of how the headphones perform within a wide range of musical genres as well as how well they sound while watching a movie/show. As for the music portion of the testing process, I go through several rock, metal, hip hop, R&B, and classical music. I have come to find out that these 5 musical genres pretty much covers the majority of music and can best test the sound quality of any headphones set. The rock and metal portion of the test provides me with how well the sound quality of the mids and highs are. Guitar riffs came out clean and nothing seemed muddled together when listening. Pass. The R&B and Hip Hop provide me with testing grounds for the bass quality. I thought that the i68’s really excelled here. A deep, full, and rich bass sound emanated throughout the music. This is especially apparent with music where the singer has a deep voice. Very, very nice. Excellent marks here. The classical music is what I use to bring it all together. Considering that an orchestral has every possible low and high sounds available, classical pieces are great to get a sense of what the overall sound quality will be. For this test, I used classical Christmas pieces. I was in a Christmas-y mood so why not? Lol Anyways, the deep, bass sound was just vibrant. The bassoons and French horns where just full of sound and the violins and woodwinds were just as clear and impressive. High marks for sound quality. Knowing that the Sound Intone i68 Headphones Headset had call functionality, I just had to do my due diligence and try it out. I’m not very big on call functions on headphones. I guess that’s because I figure that headphones are meant to be used to listen to stuff as opposed to making and taking calls. Anyways, I fired up Skype and started a few conversations with the buddies. I was able to hear all of the calls crystal clear, which was expected, but out of 4 callers, 3 claimed to be able to hear me just perfect while one had some problem listening to me. I couldn’t really understand why that was, since I made sure everything was plugged in well and I had the control bar within my speaking range. Hmmmm… I’ve been on a few calls since and I haven’t had an issue since then, but I felt as if I wasn’t doing my job if I didn’t let you guys know of that little snafu. Aside from that, no issues with the call functionality. Well… since the headphones are wired, there is no need to worry about battery life. As long as your device is still running, the Sound Intone i68 Headphones will continue to belt out the tunes. Just lil ol' me, tuning out the world and escaping into the world music! So there you have it, friends. My experience with the Sound Intone i68 Headphones. This is a great sounding, great looking, and great feeling set of headphones. And you know what… they are super cheap too! Amazon has for under $20! You just can’t go wrong for that price. Unless you are hell bent that you want a Bluetooth headset, you have to seriously consider picking up a pair of these! So what do you guys think? What do you like about this headset? What don’t you like? What are you experiences with over the ear headsets? Let’s hear it in the comments, friends! Later!